This is the third installment in the Startup Revolution Series. In the first post, we suggested humanity may be approaching—or have already passed—the tipping point between the Industrial and Information Eras. In the second, we provided data that demonstrates fairly conclusively that Industrial Era-focused blue chip companies have lost significant value over the past 50 years, as defined by return on assets. So what is rising in their place? This post will focus on the Information Era businesses that are best adapted to this new Darwinian business environment: Startups. How big is this trend? Quantifying change while it is occurring can be a fool’s errand, but varied indicators suggest a hockey stick best describes startup category growth. 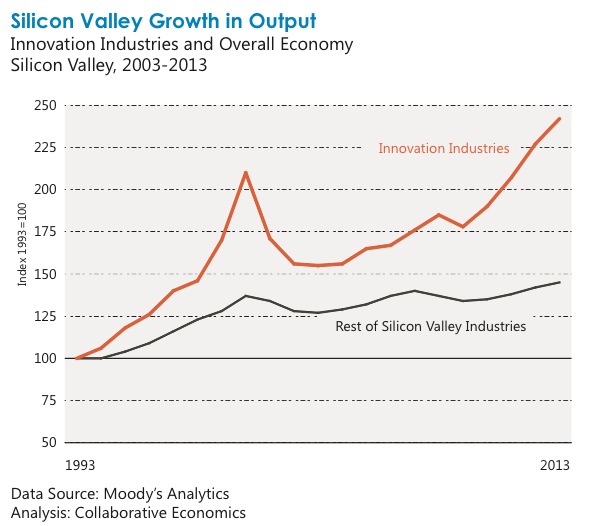 The Silicon Valley Competitiveness and Innovation Project 2015 (SVCIP) reported “The total number of patents registered annually by Silicon Valley inventors nearly doubled between 2003 and 2013.” The graph below demonstrates the growth of Innovation Industries in comparison to traditional industries in the valley. Additionally, DowJones VentureSource reported that venture capital investment in the U.S. has jumped 47% in the past year alone. And we have every reason to believe these trends are just as applicable globally. What is happening behind the scenes to foster this kind of ‘sudden’ explosion? The answer is many factors have been building to this moment for some time. Steve Blank, an entrepreneur, thought leader and faculty member at Stanford and Berkeley proposed four key reasons for the startup explosion. The cost of product development has fallen by a factor of 10 over the past decade. Code is available in free snippets, integrations are easy thanks to application programming interfaces (APIs), development comes cheap with temporary freelancers wielding plug & play tools, and once costly servers have given way to pay-as-you-go services. 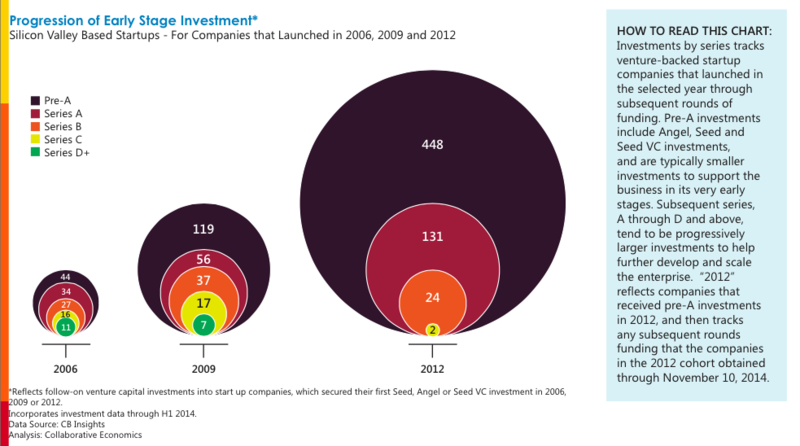 When a VC is required to spend millions of dollars on an investment, they must make a small number of big bets. But the decrease in capital needed to start a software company has opened up the VC space to new types of investors: angels, accelerators and micro-VCs. The checks they write are smaller, generally in the $10,000 to $500,000 range, which means they can make a whole lot of small bets and give birth to a larger number of startups. Many can be started on such a shoestring, they don’t even look for outside funding until later stages of development, an idea that was all but impossible a decade ago. While Industrial Era management fundamentals—from hierarchical organizational structures to rigid long-range plans—were a poor fit for the rapidly evolving Information Era, it took time to outline more successful practices. Steve Blank’s Four Steps to the Epiphany and Startup Owner’s Manual, along with Eric Ries’ The Lean Startup have provided the first commonly accepted management blueprints appropriate to startup environments, helping to strengthen success rates. Incorrect assumptions are no longer disasters, they are opportunities to pivot. Unfinished products aren’t hidden behind closed doors, they’re called public betas. Development doesn’t proceed from a binder full of requirements but a flexible list of incremental improvements that are re-prioritized every two weeks based on customer feedback. Compass has been laboring in this same vein, analyzing data to help determine what structures, processes and people are most conducive to success. The Startup Genome Report provided the first hard data behind the factors that increased the likelihood of startup success—from the critical role of mentors to the make-up of a founding team. Why Startups Fail and Premature Scaling looked at the other side, demonstrating that attempts to scale a business before product/market fit is conclusively achieved is the strongest predictor of failure. And the 2012 Startup Ecosystem Report was the world’s first map of the global expansion of high growth technology businesses, viewed by an estimated 10 million people and referenced by the Obama administration, Chancellor Merkel and countless other global leaders. Compass has recently partnered with CrunchBase to update this report for 2015, with a survey of startups and investors now in process. We encourage you to participate here. Additionally, cultural attitudes have shifted and consumers are increasingly willing to try out new solutions from emergent companies. Similarly, in a business landscape, the old saw that no one got fired for choosing IBM is giving way to an expectation that decision-makers are likely to find a cheaper, faster, more elegant solution from a previously unknown brand. It is nearly impossible to underestimate the impact of startups on the economy. In terms of wealth creation, the entire US GDP is $15 trillion. Collectively, a mere 9 companies that barely existed a decade and a half ago are responsible for one trillion of that figure. They are Amazon, Google, Salesforce, VMware, Facebook, Twitter, Groupon, Zynga and Apple (which was near death before Steve Jobs reinvented the company in 1997, and now has the largest market cap on the planet). It is highly likely that the powerhouses that will drive the global economy in 2025 are companies you’ve never heard of today. Many don’t exist yet. They will be launched from Silicon Valley, certainly, but increasingly from Chile, Israel, Singapore and the many startup ecosystems around the globe that are increasingly in frenzied competition for the magic combination of investment dollars, founders, talent and culture that leads to a thriving startup environment. With trillions of dollars of GDP at stake, it’s no wonder governments are paying rapt attention. But beyond wealth, startups also bring jobs. Lots of jobs. In fact, they’re the only ones who bring jobs. The highly influential Kauffman study demonstrated that over the past 28 years, startups were responsible for all net new job creation in the US. On average over that period, Industrial Era companies shed more jobs than they created, while startups added to the total. Moreover, this stunning finding held up even when looking at individual years. In 21 out of 28 years (75%), startups were the only net job creators. Together, these circumstances make for a very simple equation: In the coming decades, the ecosystems with the most thriving startups will enjoy the most thriving economies. In the first post we mentioned that while humanity doesn’t see transitions between eras very often, when they come, every aspect of society gets reinvented: government, business, finance, education, health, energy, technology, art and science. As the Information Era bursts into full bloom, we are seeing its dramatic impact quite notably in new values related to politics and power. A recent Harvard Business Review article studied into the cultural shifts taking place real-time. Where ‘old power’ is held by a few and jealously guarded, ‘new power’ is participatory and held by many. Increasingly, new power structures and values are pressuring, replacing or transforming older power structures that were reliant merely on consumption. 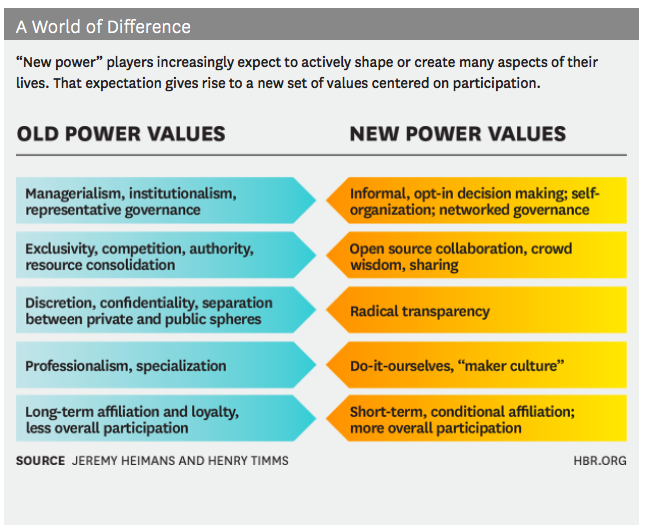 New power structures cater to the new ideals of an Information Era society: People expect to share, shape, fund, produce and co-own companies, products, ideas, governments and even art. They feel an inalienable right to participate and value informal decision-making, collaboration, do-it-yourself ideals, transparency and informal affiliation rather over long-term allegiance. While the authors argue that some old power structures are necessary for forward momentum (as evidenced by the failure of both Occupy Wall Street and the Tea Party to effect lasting change), there is little doubt that the Information Era values are thoroughly transforming expectations of Industrial Era power structures. To be successful moving forward, both structures must learn from each other. Innovation is never clean. It is never linear. Our way forward in the Information Era will invariably have many fits and starts. It will take false turns. (We’re still waiting for the personal jet packs promised by earlier visionaries). But nor can we hold back the tide of change. We must reinvent ourselves with care but also with courage. We must objectively study the data, impassively evaluate the outcomes and boldly incorporate the factors that help drive our combined success. We must be prepared to continuously evolve, to push through boom and bust cycles with an eye towards the longer horizon and understand that what drives growth today will be different from what drives growth tomorrow. The innovation history of Silicon Valley is a valuable model to consider. From the perspective of today, tomorrow may appear murky, but there is one thing we can see with the clarity of a crystal ball. Our future will be constructed from the building blocks of the Information Era. As we speak, entrepreneurs are crafting our path forward in garages around the world. Welcome to the rise of the startup.